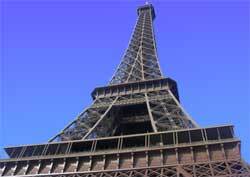 It's the photo icon of Paris and France - and one of the most recognizable structures on earth. Elevator wait lines (especially for the third level) can be excruciatingly long during the summer tourist season. Be the first in line when the gates open in the morning or arrive after 6 pm. It also helps to avoid weekends. The best photo location for a full-view shot of structure is from the Place du Trocadero terrace across the Seine River. It was built in 1889 for an international exhibition in Paris, France and named for its builder, Gustave Eiffel. Some people back then thought it was hideous. One sarcastic critic famously said he liked being on the Eiffel Tower because "it's the only place in Paris where I cannot see it". Times have changed. Almost all Parisian citizens today love it.